A recent scoring slump has the St. Louis Blues in danger of falling out of playoff contention in the Western Conference. The Blues look to avoid matching a season high with their seventh straight loss when they host the lowly Los Angeles Kings on Tuesday night. St. Louis (28-27-10) lost 2-0 at home against San Jose on Saturday to fall to 0-5-1 in its last six games following a 4-0-1 stretch. It was the second time in four games an opponent shut out the Blues, who have been outscored 16-4 during their current slide. They now have the second-fewest points in the West, ahead of only Los Angeles (26-36-5), and are eight points out of the final playoff spot. "We can lose games and we can lose games where we feel like the effort wasn't strong enough," said St. Louis coach Andy Murray, whose team went 0-5-2 from Jan. 11-24. "We know our opponents are very good, but (Saturday) wasn't satisfactory, that's for sure." St. Louis has missed the playoffs each of the last two seasons after making it 25 straight times. Saturday's loss came the same day Blues goal-scoring leader Brad Boyes signed a four-year, $16 million contract. Though the 25-year-old forward is among the NHL leaders with 32 goals, he's been held without a point in his last six contests. "I was definitely contributing earlier in the season," said Boyes, who has just three goals and two assists in his last 17 games. "I'm here to score goals and I've got to score goals. Guys are blocking shots, guys are making saves. I've got to score goals." Boyes hasn't registered a point in three games against the Kings this season. 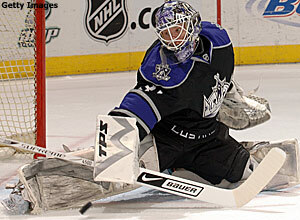 Manny Legace made 32 saves against San Jose in his sixth straight loss. Despite little offensive help, Legace has managed to hold his own during the losing streak, allowing more than two goals twice over that span. He allowed four goals as St. Louis lost 5-1 at Los Angeles on Feb. 21 to snap a five-game winning streak over the Kings and start the Blues on their current slide. The All-Star, though, is 10-2-0 with a tie and a 2.76 goals-against average against the Kings. St. Louis has won two of the three meetings with Los Angeles this season and three in a row at home overall versus the Kings. Los Angeles, nine points back of St. Louis, tries to avoid a fifth straight loss after falling 2-1 in overtime at Minnesota on Sunday. Michael Cammalleri had a goal for his 200th career point and Erik Ersberg made 33 saves in his first NHL start for the Kings, who have lost five in a row on the road. Ersberg, the sixth goalie to start for the Kings in 2007-08, could earn another start Tuesday as Jason LaBarbera remains day-to-day with a groin injury. "It's a little bitter when you end up losing the game, but we got one point and I'm happy with my performance," said Ersberg, who's stopped 51 of the 54 shots he's faced in two games. Cammalleri, who has a goal and four assists against St. Louis this season, has three goals and three assists in his last four contests overall.